The Whirlpool is a neighboring galaxy to the Milky Way that is teaching astronomers about how galaxies interact with each other and how stars form within them. The Whirlpool also has a fascinating structure, with its spiral arms and central black hole region. Its small companion is the subject of a great deal of study, as well. For amateur observers, the Whirlpool is a joy to observe, showing a classic spiral shape and a curious little companion that appears to be attached to one of the spiral arms. The Whirlpool (also known as Messier 51 (M51) is a two-armed spiral galaxy that lies somewhere between 25 to 37 million light-years away from our own Milky Way. 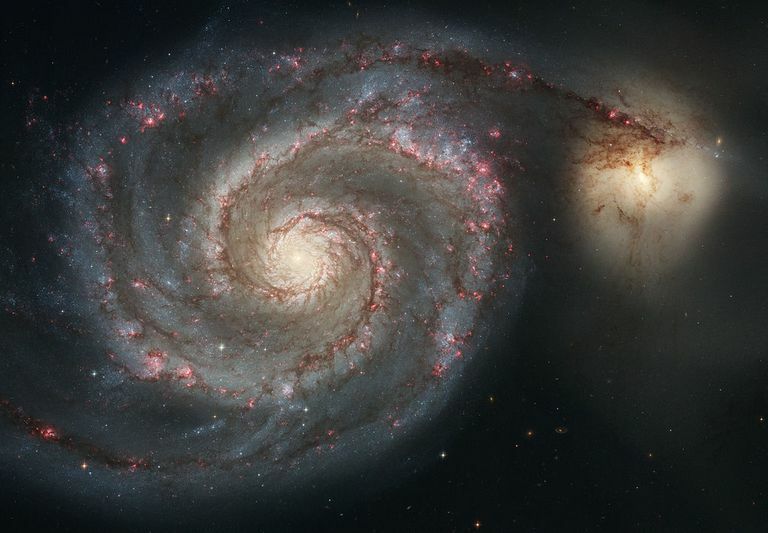 It was first discovered by Charles Messier in 1773 and got the nickname of "The Whirlpool" due to its beautifully wound-up structure that resembles a vortex in water. It has a small, blobby-looking companion galaxy called NGC 5195. Observational evidence suggests that the Whirlpool and its companion collided billions of years ago. As a result, the galaxy is bristling with star formation and long, delicate-looking streamers of dust threading through the arms. It also has a supermassive black hole at its heart, and there are other smaller black holes and neutron stars scattered throughout its spiral arms. When the Whirlpool and its companion interacted, their delicate gravitational dance sent shock waves through both galaxies. As with other galaxies that collide and mingle with stars, the collision has interesting results. First, the action squeezes clouds of gas and dust into dense knots of material. Inside those regions, the pressure forces the gas molecules and dust closer together. Gravity forces more material into each knot, and eventually, the temperatures and pressures get high enough to ignite the birth of a stellar object. After tens of thousands of years, a star is born. Multiply this across all the spiral arms of the Whirlpool and the result is a galaxy filled with star birth regions and hot, young stars. In visible-light images of the galaxy, the newborn stars show up in blue-ish colored clusters and clumps. Some of those stars are so massive that they will only last for tens of millions of years before blowing up in catastrophic supernova explosions. The streamers of dust in the galaxy are also likely a result of the gravitational influence of the collision, which distorted the clouds of gas and dust in the original galaxies and tugged them out across the light-years. Other structures in the spiral arms are created when newborn stars blow through their star birth créches and sculpt the clouds into towers and streams of dust. Because of all the star birth activity and recent collision reshaping the Whirlpool, astronomers have taken a special interest in observing their structure more closely. This is also to understand how the process of collisions helps shape and build galaxies. In recent years, the Hubble Space Telescope has taken high-resolution images that show the many star birth regions in the spiral arms. The Chandra X-Ray Observatory is focused on the hot, young stars as well as the black hole in the core of the galaxy. The Spitzer Space Telescope and the Herschel Observatory observed the galaxies in infrared light, which reveals intricate details in the star birth regions and the dust clouds threading throughout the arms. The Whirlpool and its companion are great targets for amateur observers equipped with telescopes. Many observers consider them a sort of "Holy Grail" as they search for dim and distant objects to see and photograph. The Whirlpool isn't bright enough to spot with the naked eye, but a good telescope will reveal it. The pair lies in the direction of the constellation Canes Venatici, which is located just south of the Big Dipper in the northern sky. A good star chart is very helpful when looking at this area of the sky. To find them, look for the end star of the Big Dipper's handle, called Alkaid. They appear as a faint fuzzy patch not too far from Alkaid. Those with a 4-inch or larger telescope should be able to spot them, particularly if viewing from a good, safe dark-sky site. Larger telescopes will give a finer view of the galaxy and its companion.